Need Computer Office Desk!! WOAH!! 【Overall Size】: L47 x W23.7 x H29.5 inch, weighs about 35lbs, provides large working space. 【Firm Material】: E1 solid partical wood with high resistance on scratch & friction. 【High Stability】: 1.2 mm thick metal frame, which is 1.3 times thicker than ordinary 0.8mm ones, better stablize the desk more than usual with heavy weights. 【Advantage】: 1.5 bolts to screw the legs, more stable and durable; 2. Feet can be adjusted between 0.4 to 0.8 inch, which make the desk keep stable on uneven floor. 【Quality Assurance】Need desk has certification of "BIFMA", accorded with US office furniture standard. If your item arrives damaged, broken, scratched, or dented, we will send you a replacement or give you a partial refund, please be assured to purchase. 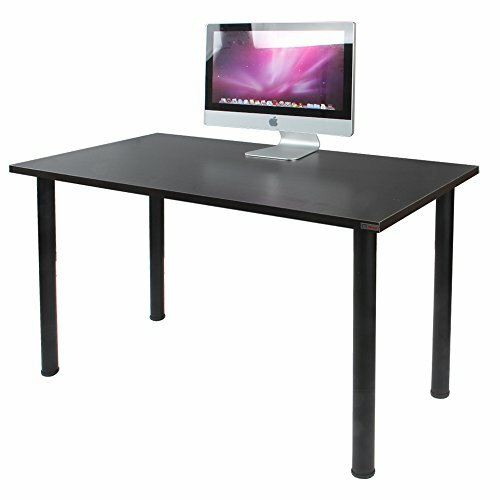 The Need large size computer desk which is 47 inch length offers a spacious and efficient workplace for your home or office. Enjoy a beautiful traditional look with smart features for your convenience. The simple square design provides a large durable work surface and just the right amount of storage to keep you feeling neat and organized. With the large size, it is perfect to use as a meeting table, conference table, working desk etc. The computer desk quality construction meets ANSI/BIFMA test standards for safety and performance. A rich glossy finish provides a simple, elegant and timeless appearance for using.